[New for 2019] Well, it finally happened..... all those bare freezer shelves are finally full of new 2019 products! I knew it was close and yet I was still stoked to see three employees blitzing the Stop & Shop freezer aisles this morning. I went back at lunch and found all the great treats that our midwest friends have been finding for the last month. I literally didn't know where to start, but then I figured I should go with the brand that generated so many early hits on this blog. Oh yeah, it's time to dig in to one of three new cookie dough core flavors. 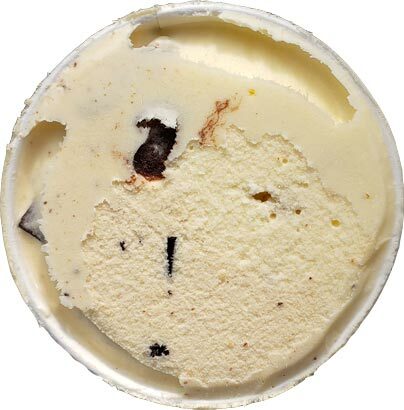 At first I think I'm looking at just vanilla ice cream, but if you look super close, you can see a very slight color variation between the vanilla ice cream and the peanut butter ice cream. Unfortunately the top is a bit freezer burned [I saw the ice cream sitting out this morning during the shelf reorganization and was worried this might happen]. Thankfully the damaged texture doesn't go too far down. That's what you are waiting for right? It's ok. 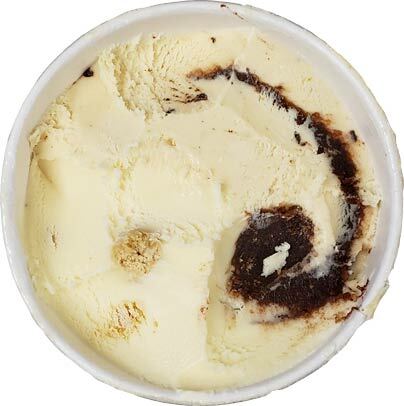 Most of us know what Ben & Jerry's ice cream tastes like at this point, the swirl is what's different here. The scary thing is, I'm not sure how to describe it because it doesn't have a ton of flavor. Maybe a close up will help. This core is more about texture than anything else. There's no sugar blast here. It doesn't taste of flour, nor does it taste of cocoa. It's just kind of there. 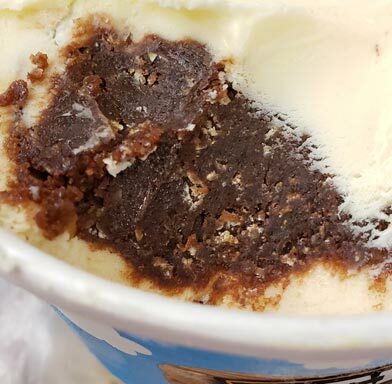 To be honest, it makes me feel like a pretty terrible food blogger.... what I can tell you is that it has a ton of texture, a texture you may never have had in an ice cream before. It tastes a bit like there are ground up pretzels in there (ahhh, I just scared Marvo away!). To say that in a much simpler way, if you get a bit of everything on your spoon, it's a pretty darn cool scoop of ice cream. In life and in ice cream, I love things that are different. Such a unique texture is a total #funfactor moment for me. Wonder how I'll feel about it tomorrow? On Second Scoop: Yeah, it grew on me. Could you equate this to the fun generated by a mix-in filled pint? Yeah, I think you could. So many of us want at least one mix-in in every spoonful and being able to add a bit of textured core to every bite really keeps this one fun for me. I was totally tempted to finish the pint today but decided to leave the rest as a special snack for Monday. It seemed like the core lineup might be headed to pasture but it's back with a vengeance! Glad you enjoyed it because I was done with this line with the past flavors. Each one was only a single purchase for me. But I have hope now, and I’m a sucker for new flavors. I’ll try these. Agreed, none of the core flavors every really click with me. It's a fun idea, but it needed some pizzazz. I'm looking forward to the other two. Hmm. 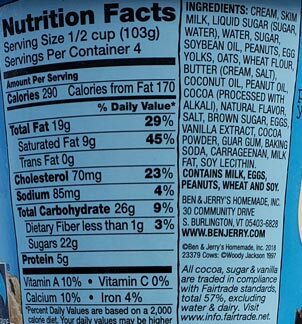 While texture is great, it still seems a little weird that the seemingly defining feature of the pint is relatively flavorless. Is the core supposed to be peanut butter cookie dough (not what I would have guessed from the picture), so maybe that's why it doesn't stand out as much? Last core flavor I remember was the Speculoos version several generations ago. If your picture (and description of being able to get some in every bite) is typical, it looks like they gave the core a bit of a swirl, which seems like a nice improvement: my memory of the Speculoos was it just having a thick core right in the middle that didn't really melt/mix with the ice cream without a decent amount of effort. Looking forward to your reviews on the other flavors. Some of the cores are just too much stuff, not enough ice cream. Boom Chocolatta would be amaaaaaaaazing with less cookie, more mocha. Or just a pint of mocha. I'm actually digging the core on this one. 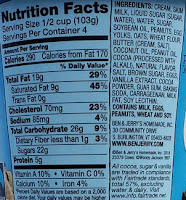 Oats is on the ingredients list and that's the flavor going on here for me. That flavor does get kind of lost if there's alot of ice cream on the spoon. I think this one will be a disappointment for people who are all about the mix-ins; the pint I had was mostly ice cream without alot of texture/flavor from mix-ins to break it all up...just like a bad DQ Blizzard. I've never heard of anything flavorless related to ice cream. And coming from Ben and Jerry's, that's doubly bizarre. 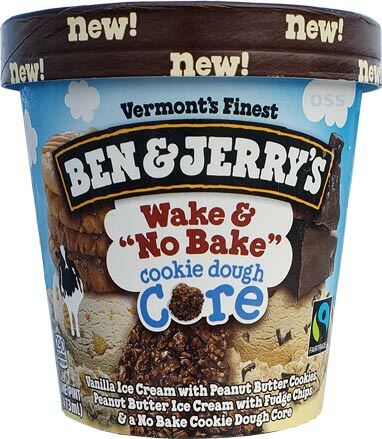 Still, I am super curious about the new cookie dough cores and can't wait to read your thoughts on the other two. @Endless: I'm not always the best at describing a flavor, especially when it's mild and non-distinct. Anon mentioned it being oat flavored but I didn't pick up on that, but maybe lingering peanut butter flavor was messing with me. I personally found the no bake cookie core to be disgusting. Had a coffee grounds texture to it and was very unappealing. I was real hopeful for it too because I love no bake cookies but I just think it fell way too flat. However, the cookie dough core was delicious! Would definitely buy that one again.